Standing watch over the southwestern tip of Australia and marking the meeting point of the Indian and Southern Oceans, the Cape Leeuwin Lighthouse boasts a dramatic location. The 39-meter-high tower also makes a striking photo opportunity, with its stark white brick set against a backdrop of deep blue ocean and crashing waves. As well as being located within the Leeuwin-Naturaliste National Park, the famous lighthouse serves as the starting point of the renowned Cape-to-Cape hiking trail, which runs for 135km along the coast. Built in 1895, the historic lighthouse remains in use, but is now equally significant as a tourist attraction. Tours allow visitors to peek behind-the-scenes of the lighthouse, see the old waterwheel and climb the 186 steps to the top-floor viewing deck. A visitor center, shop and café are also located on-site. 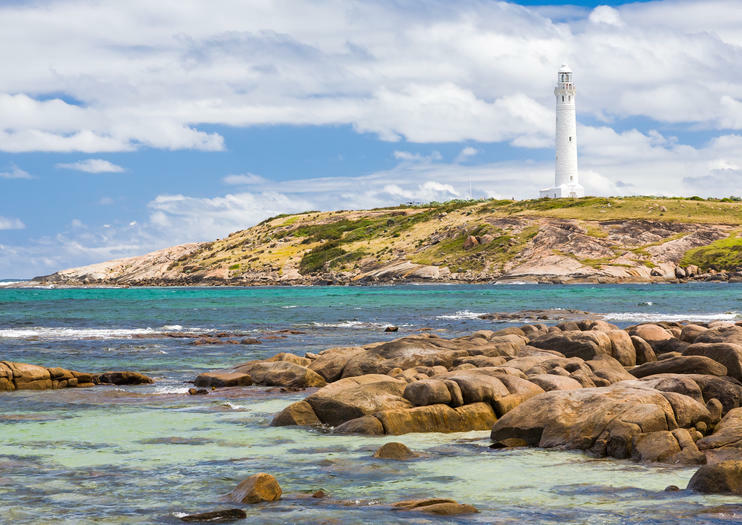 The Cape Leeuwin Lighthouse is located at the southwestern tip of Australia and is open daily from 9am to 5pm, with tours held every 40 minutes. The historic Cape Leeuwin Lighthouse is situated at the most south-westerly point of Australia; the tip of a spectacular peninsula where the Southern and Indian Oceans meet. As the tallest lighthouse on mainland Australia, Cape Leeuwin Lighthouse is a must-see attraction. On the half-hour guided tour, you will climb up to the top of the tower, where a vast seascape of crashing waves and wild rocky shoreline unfolds. Experience Western Australia's Cape to Cape Track without camping on this 8-day tour from Perth or Fremantle. You'll explore the Margaret River coastline between Cape Naturaliste and Cape Leeuwin on a 85-mile (135-km) walk with a guide, who points out the best views of the white-sand beaches and the waves of the Indian Ocean. You'll spend seven nights in lodge-style accommodation in the area of Prevelly, meaning you'll only need a day pack for each of your walks—no need to carry camping gear. This tour is designed ideally for those over 50 years of age.